when is the last time you went to Confession? when is the last time you celebrated the Sacrament of Joy? i'm getting excited now for our pilgrimage to Dublin, Ireland! and many of our pilgrims - 26 in total (meeting is tomorrow, by the way) - will be preparing by experiencing God's mercy through this wonderful Sacrament. this year's IEC2012 theme is the Eucharist: communion with Christ, communion with one another. however, you can't have one without the other. nonetheless, how many times do i hear people say, "do i have to?" we have all had these words on our hearts, and on our lips at one point throughout our lives. why do we need to confess? i don't want to tell the priest my sins! i was reflecting on this last week, as i was preparing to kneel as the penitent. it is not so much that we don't want to share, but that we like to keep things secret. "we don't keep secrets, secrets keep us!" no matter what needs to be confessed, the interior battle to keep things secret is exhausting! only when things are out in the open can the light of Christ begin to heal us. 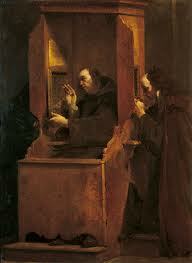 go to Confession, the priest is bound by the Sacramental Seal. the other guy wants you to keep it to yourself, because that secret will separate you from God. indeed, that's what sin is all about - separating us from God, from neighbour, from self. as Christians, as Catholics, we need the two greatest Sacraments in order to walk upright: the Eucharist, and Confession. as C.S. Lewis once wrote, be surprised by joy, and go celebrate the Sacrament of God's divine mercy, the Sacrament of Reconciliation! Christ is Risen, He is truly Risen, alleluia!!! CONGRESS COUNTDOWN: 6 WEEKS 4 DAYS 3 HOURS 18 MINUTES 43 SECONDS. In this season of Easter, the joy of the Resurrection, and Vocations Sunday, let us pray for all our children preparing for First Communion. Jesus’ messianic project, however, seemed to have failed miserably with his Death on a Cross. That was not the end of the story however. The Risen Christ conquered death. Where sin existed, with all its darkness, division and dread, now grace abounded with all its light, communion and freedom (cf. Rom 5:17-21). The Risen Crucified Christ reconvened his community. The bonds of fellowship deepened. He was alive, building up his community through the Gospel proclaimed, through the sacraments, especially the Eucharist administered, through the service of those entrusted with ministry, through charisms and through the mutual love of the members of the Church: ‘they devoted themselves to the apostles’ teaching and fellowship, to the breaking of bread and the prayers’ (Acts 2:42). Just as it was during his life on earth, and indeed more so, those now following Christ were not on their own. They were united in communion with Jesus Christ and so with one another through many bonds of communion but especially through the Eucharist. (#9, The Eucharist: Communion With Christ And With One Another).